WHEN: Sunday, March 10, 2019, noon-4 p.m.
You have two ways to participate! For both options, the Heroes Foundation offers user-friendly digital tools to help you be a successful fundraiser and ambassador for the Heroes Foundation. 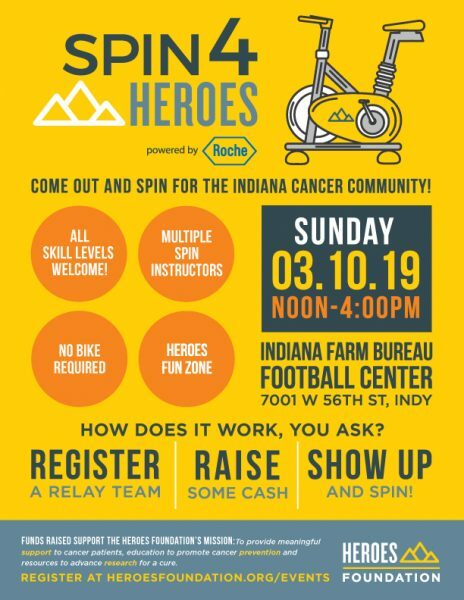 Spin4Heroes is an indoor, 4-person, relay-style team cycling/spinning event featuring spin instructors, music, prizes and snacks to keep riders of all ages spinning and happy. Spin4Heroes team captains register a team, recruit team members, and then together they raise funds ($400 minimum). Anyone can participate in Spin4Heroes! It doesn’t matter if you have never been on a bike, take weekly spin classes, or if you compete on the local/regional cycling circuit. Participants work out as hard (or as little) as they want! Participate as a Spin4Heroes remote participant. You set the pace and parameters! Pick your favorite activity — biking, running, swimming, yoga, tennis, hiking — and then set an activity goal and a fundraising goal ($100 minimum). Click for ideas! If you prefer, grab a coworker, friend, family member or neighbor and do this together. The Spin4Heroes remote participant campaign runs from February 8 until the day of the Spin4Heroes event, March 10. SPONSORSHIPS: Now through March 1, 2019, we are seeking sponsors for Spin4Heroes. Join the Heroes family of generous corporate sponsors. Rally your coworkers to form teams and ride! Consider Tour, Stage or Prologue level sponsorships ($500-$2,500 each; $5,000 Presenting sponsor level unavailable). See all of the details and benefits in the 2019 Corporate Sponsorship Program. DRESS: No super-technical gear is required for Spin4Heroes. But we want you to be comfortable in the saddle. Bike shorts are a popular option, but many participants wear running or other athletic shorts as well. You can warm up quickly if you’re riding hard, so sweat-wicking layers on top are a smart option. KIDS: In addition to the spinning, we will have a the Heroes Fun Zone, which will include bounce houses, an obstacle course, face painting and more for the kids! VOLUNTEER: Sign up to play a heroic role in Spin4Heroes. We have lots of volunteer opportunities available. Please contact Cindy Todd at ctodd@heroesfoundation.org to learn more.